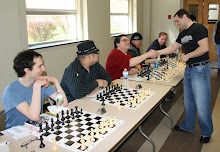 Here is my game against David Levin in the recent New Jersey Open. * I followed the book for the first few moves before deciding on a plan. Perhaps you could expand on my annotations. 12.b3 Rb8 13.Bb2 b5 14.Ba1 Qd7 15.e3 Bf7 16.Nxe7+ Nxe7 17.Qc2 b4? 35...Rxd7 36.Rxd7 Qe8 37.Ra7 Ne5? 46.Qxh6+ Ke7 47.Bd5, Black resigns. 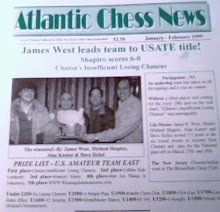 I reviewed the first release of New Jersey master Jim West's monograph The Philidor Countergambit in Virginia Chess 1995/1. Now we have a "revised 2nd edition", and no exaggeration that; the work looks completely rebuilt from ground up. Analysis is both updated and greatly expanded. New publisher Chess Digest has likewise upgraded the production quality, including slicker cover and binding. The word "Dynamic" has been inserted into the title. To call 1.e4 e5 2.Nf3 d6 3.d4 f5 "dynamic" is like saying Kasparov was "irked" at losing to DEEPBLUE. This is an intense tactical line. 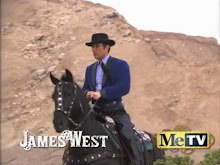 West is entirely justified in claiming it as his own. While "theory" may stigmatize it, West has honed his pet into a promising weapon by toilsome analysis and sheer will. "From February 1990 through...June 1996," he reports, "I have essayed the Philidor Counter-Gambit on 135 occasions. My record stands at 72 wins, 36 losses, and 27 draws." Singleminded devotion brings practical benefits. 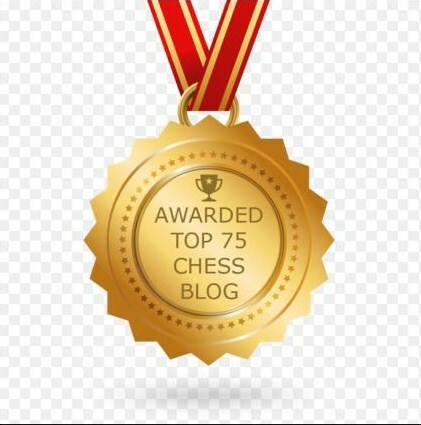 "Where it once seemed madness to play the unclear complexities of the PCG, it now seems foolhardy to play the Sicilian Defense, when even class C players know the first fifteen moves from memory....I recall how in [one] game my opponent (a master) spent one full hour on his 4th move!" Even a crazy combinative mess like the Philidor Countergambit demands more than sheer calculation (try it out versus your computer if you want to test this assertion) and readers would benefit from West's seasoned judgment. Unfortunately the dearth of useful commentary - generalizations, strategic themes, etc. - is one aspect of the book that has not been improved since the original edition. Instead West offers copious analysis with terse assessments like "unclear" or "with a strong attack." On the other hand, the important lines with 4.exf5, shorted badly the first time around, now rate a full chapter. West notes that instead of Roush's 11.Nc3? Bxh2+! White could have forced an advantage with either 11.Bf7+ Nxf7 12.Nxf7 Bxh2+ [or 12...Kxf7 13.Rxf5+ Kg8 14.Qg4 Qe7 15.Nc3] 13.Kxh2 Qh4+ 14.Kg1 Bg4 15.Qd2 O-O 16.d5; or 11.Nf7 [I independently discovered this some time after my annotations appeared] Bxh2+ [11...Nxf7 12.Rxf5 O-O 13.Qg4 is also +/-] 12.Kh1! Qh4 13.Bg5 Qg3 14.Bxh6 gxh6 and now West gives 15.Qh5! Bg6 16.Qxh2 Qxh2+ 17.Kxh2 Rf8 18.Nxh6 Rxf1 19.Bxf1 Nxd4 20.Na3 O-O-O 21.c3 Ne6 22.Nc4. For the record West also examines the less convincing moves 11.Qh5+ and 11.h3, as well as rehabilitates Black's play earlier by 10...Ng4 (he marks my 10...Bd6 with "?!") 11.Qd2 Nxe3 12.Qxe3 Qxd4 13.Qxd4 Nxd4 14.Nf7 b5 15.Bd5 c6 16.Bxc6+ Nxc6 17.Nxh8 [17.Rxf5? Nd4 Black wins] g6 unclear. After 4.Nc3 fxe4 5.Nxe4 d5 6.Neg5!? [6.Ng3 was a famous Bird-Morphy game; 6.Nxe5 dxe4 7.Qh5+ g6 8.Nxg6 Nf6 (or 8...hxg6) is the main line, widely assumed to favor or even win for White. Needless to say, West begs to differ...]. West gives only 6...h6 7.Nf7!? [or 7.Nh3 Bxh3 8.gxh3 (Fedorowicz-West, New York 1996) exd4 unclear] Kxf7 8.Nxe5+ Ke7 9.Ng6+ Kf6 10.Qf3+ Bf5 11.Nxh8 Qe7+ 12.Be2 Qe4 13.g4 Qxf3 14.Bxf3 Bxc2 15.h4 Nc6 16.g5+ Kf5 17.Be3 Bb4+, Stepanov-Maliutin, Moscow 1992 (0-1, 47). A game too recent for inclusion in The Dynamic Philidor Counter-Gambit varied with 7.dxe5!? hxg5 8.Bd3 Rh6 9.Bxg5 Be7 10.Bxh6 Nxh6 11.Bg6+ Kf8 (Adamec-West, 1997 US Amateur Team). West discussed this in the March/April issue of Atlantic Chess News (his regular outlet for the latest Philidor refinements. "Although my teammates questioned my judgment after the game, I already think Black is slightly better. Sure, White has a rook and two pawns for two minor pieces, which in an endgame would give him good winning chances. But that endgame is a long way off. In the short run, Black's bishop and knight are stronger." (That one note, incidentally, is about 2 1/4 sentences more loquacious than the longest remark in The Dynamic Philidor Counter-Gambit). The game continued 12.Qe2 Nc6 13.O-O-O [13.O-O] Be6 14.h3 Kg8 15.Nh2 d4! 16.f4 Qd5 17.c4 ["White decides to jettison a pawn and eliminate queens rather than allow the mechanical attack after 17.b3 Ba3+ 18.Kb1 a5, etc."] Qxc4+ 18.Qxc4 Bxc4 and Black won in 60. Going back, one must ask why Black avoids the natural 6...e4. In the different closed defenses to the Ruy Lopez (considered sounder than the more open counterattacking variations), the play from the start spells a great deal of tension for both players. White is the first to break in the center and hopes that, by putting enough pressure on the center, he will gain time to expand on the queenside and/or kingside, thereby stifling Black's game. This often happens to the point where a winning attack can not be far behind! Black, to the contrary, hopes to maintain his strongpoint on e5 with a pawn or a piece, reposition his pieces so that any premature attack on White's part will backfire, expand where possible, exchange pieces if necessary, and be prepared to counter in the center. All this leads to nervewracking play where sudden attacks sometimes appear out of a clear blue sky. But, in reality, the position has been pregnant with these possibilities all along, waiting only for the right tactical moment to materialize. Often the outcome is decided by whose initial maneuvers were more to the point. 13...cxd4 14.cxd4 exd4 15.Nb3 Nd7 16.Nbxd4 Nxd4 17.Nxd4 Re8 18.Nf5 Bf8 19.Bf4 Ne5 20.Ne3 Be6 21.Rc1 Rac8 22.Nd5 Qb7 23.Bb1 Nc4 24.Qd4 Bxd5? 33.Qh7+ Kxf6, and Black resigns. Happy New Year to you and the rest of New Jersey! I am still out here in Missouri. 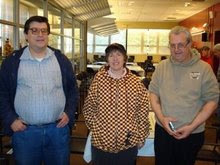 Recently I competed in the 22nd Annual Xmas Tree Open in Independence where I scored 3 wins and 1 draw. I took a half-point bye in the first round, as I attended the Los Angeles Rams versus Kansas City Chiefs playoff game at Arrowhead Stadium. 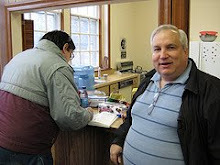 The following is my fourth round encounter with Martin Phillips of Springfield, Missouri. 1.e4 c5 2.Nc3 Nc6 3.f4 g6 4.Nf3 Bg7 5.Bc4 d6 6.O-O Nf6 7.d3 O-O 8.e5? 23...h5! 24.Rf2 Bf6 25.Nf3 Kg7 26.Qe4? Bb7 27.Qe2 Rh8 28.Ne5 h4! 29.Nxd7 Ng3+ 30.hxg3 hxg3+ 31.Kg1 gxf2+ 32.Qxf2? 32...Qxd7 33.Be3 Qd5 34.Bb3 Qh5 35.Kf1 Qg4 36.Kg1 Bh4 37.Qd2 Bg3 38.Bf2 Bh2+ 39.Kf1 Bxf4, White resigns. 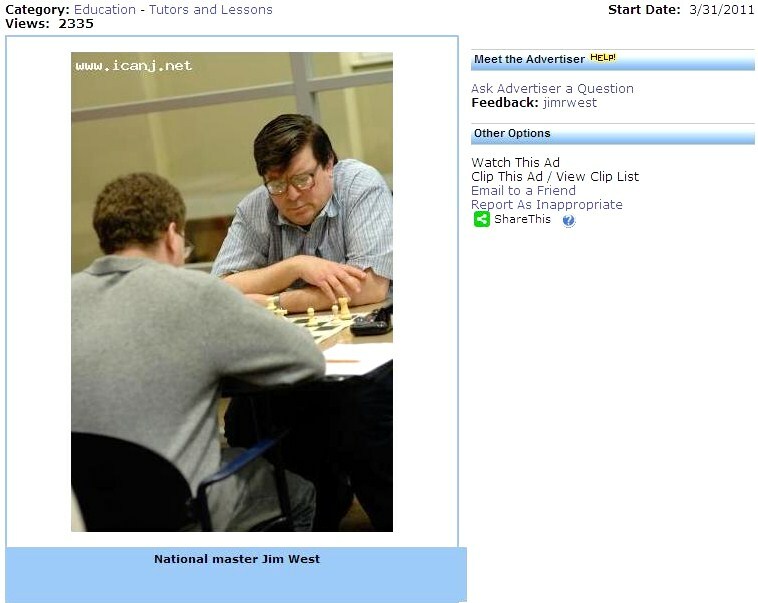 "I unfortunately only have the first edition of West's book, published by Chess Enterprises in 1994, so I don't know the correct line after 10. Nxh8+ Kg7 11.Bg5 when West gives 11...Nc6 12.Bxf6+ Qxf6 13.Qxf6+ Kxf6 14.Bc4 Nxd4 15.O-O-O Ne6 16.Rhe1 Bd6 17.Rxe4 Bd7 18.Rde1 Ng5 19.Rh4 Rxh8 leaving this as '=' when White actually wins with 20.Rh6+ Kf5 (20...Kg7 21.Rxd6 cxd6 22.Re7+) 21.Bd3+. No doubt he has since come up with an improvement." when fortunately for me White missed 20.Rh6+ Kg7 21.Rxd6! cxd6 22.Re7+ as pointed out by Goeller. This oversight was corrected in the second edition of my book as follows: 14...Na5 15.Bd5 Bf5 16.g4 c6 17.Bf7 Bxg4 18.Rg1 Be6 unclear. I am submitting this postal game for publication in Atlantic Chess News. 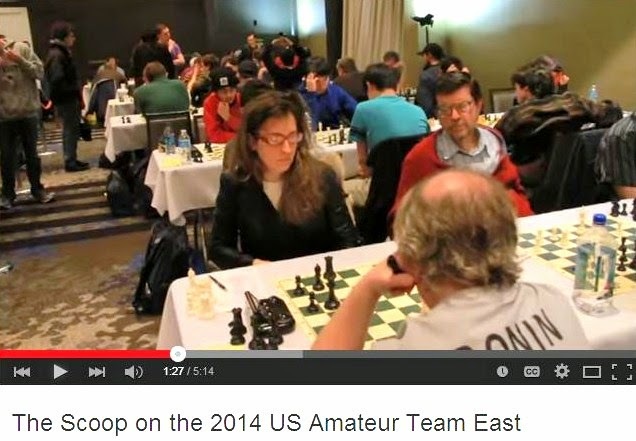 It was played in the Correspondence Chess League of America national team championship. It features the gambit variation of the Cambridge Springs Defense and shows how center control and general pressure compensates for a pawn minus. The loser played imprecisely, but I challenge anyone to find a smooth course for Black in any case. This is one of the better Queen's Gambits I've ever played, and I hope you like it. 17...Rf8 18.Bh4 Nf5 19.Bf2 g6 20.Qe2 Bd7 21.Rab1! 27.Qa3 Rb7 28.d5 cxd5 29.exd5 exd5 30.e6! This is my game versus Larry Christiansen from round two of the 1990 New Jersey Open. I hope you can use it in your column. In the game, I caught Christiansen napping on move 30. From my "sham" pawn sacrifice on move 31 to the conclusion of the game, I felt confident that my position was fine. As a result of my 2-0-4 record, I am once again in master territory. At the 1990 Manila Interzonal, DeFirmian played 4...c5 5.dxc5 Na6 6.a3 Bxc3+ 7.Qxc3 Nxc5 twice. Ivanchuk proceeded 8.b4 Nce4 9.Qd4 d5 10.c5 b6!? 11.f3 bxc5 12.bxc5 Qa5+ 13.Qb4 Qc7!? 14.fxe4 Rb8 15.Qa4+ Bd7 16.c6! O-O 17.Bd2 Bxc6 18.Qa5, and here DeFirmian suggests 18...Qe5!? with interesting complications. 8...h6 9.Bxf6 Qxf6 10.e3 e5 11.d5 Ne7 12.Be2 O-O 13.O-O Bd7 14.Rfd1 Qg6 15.Nd2 Kh8 16.f4 exf4 17.exf4 Rfe8 18.Re1 Ng8 19.Bf3 Nf6 20.Qd4 Bg4 21.Bxg4 Qxg4 22.Qf2 a5 23.g3? 23...Qf5 24.Qd4 a4 25.Nf3 Nd7 26.Re3 Rxe3 27.Qxe3 Nb6 28.Qe2 c6 29.dxc6 bxc6 30.Rc1 Rb8? 41...Rc7 42.Rb4 Rc2 43.Kg3 Rd2 44.Rxa4 Rxb2 45.Ra7 h5 46.a4 Rb3+ 47.Kg2 Ra3 48.a5 Kf5 49.Rxg7 Rxa5 50.Rf7 Ra3 51.Rf8 h4 52.Rh8 Ra2+ 53.Kh3 Kxf4 54.Rxh4+ Kf3 55.Ra4! What's New in the Philidor Countergambit? 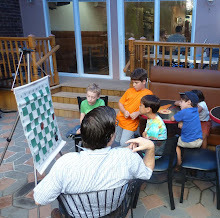 I've written in Virginia Chess about the notorious countergambit 1.e4 e5 2.Nf3 d6 3.d4 f5!? on several occasions. The key move 3...f5 was Philidor's own method of handling the defense that bears his name. Today its reputation is close to a forced loss, but things are not that simple! I've had decent results with this opening, and feedback I've gotten from readers indicates that they've been entertained at least, and some were even emboldened to risk the variation themselves. stems from an 1864 game that continued 10...Kg8 11.Bg5 Bg7 12.Nf7 Kxf7 13.Bc4+ Kf8 14.O-O-O with plenty of pawns and strong pressure to boot. Zukertort won by methodically handling the rook + pawns against two pieces in a long (71 moves) endgame. But West introduces 10...Kg7 (!) and cites one of his own games: 11.Bg5 (11.Bh6+ Kxh8 12.Bxf8 Nc6! 13.Qc5 Nd7 14.Qd5 Qxf8 15.Qxe4 Qb4+ -/+) Nc6! 12.Qg3 (if 12.Bxf6+ Qxf6 13.Qxc7+ Kxh8 Black threatens both the d-pawn and winning White's queen by ...Bd6. 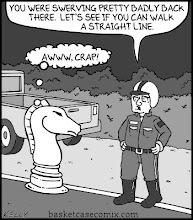 He's also okay, says West, after 12.Bxf6+ Qxf6 13.Qxf6+ Kxf6 14.Bc4 Nxd4 15.O-O-O Ne6 16.Rhe1 Bd6 17.Rxe4 Bd7 18.Rde1 Ng5 19.Rh4 Rxh8) Kxh8 13.d5 Nb4 14.O-O-O Be7 15.a3 Na6 16.Bxa6 bxa6 17.Rhe1 Rb8 18.f3 Bd6 19.Qh4 Be5 20.b4 Qd6 21.f4 Ba1 22.Re3 (22.Kb1 Bc3 23.Re3? Rb4+! -+) Ng4 23.Rh3 Bf5 24.Rg3 (24.c3 e3 -/+) a5 25.c3 axb4 26.h3 (26.axb4 e3 27.Rxg4 Bxc3 28.Rg3 Rxb4 -+) bxc3 27.hxg4 and 0-1 (27...Qxa3#), McDonnell-West, 1993. The first 34 pages contain a dense web of analysis organized around four Morphy games from London 1858. Chapter 1 covers the traditional main line 4.dxe5 fxe4 5.Ng5 d5 6.e6 Nh6 (Staunton & Owen - Morphy & Barnes). Chapter 2 blankets the important offshoot 6...Bc5 (Barnes - Morphy). Chapters 3 and 4 cover White's 4th move alternatives 4.Nc3 (Bird - Morphy) and 4.Bc4 (Boden - Morphy, London 1858) respectively. 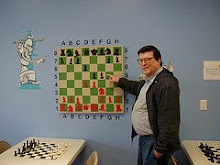 The Morphy games are given in full and some of the analysis addresses points that are well beyond the opening proper. Others' games and fragments are embedded in notes. A significant omission is the neglect of 4.exf5, apparently for no better reason than nobody ever played it against Morphy. Twenty "supplemental games" comprise the back third of the monograph. (4.exf5 does appear in two of them, so West doesn't ignore that subvariation entirely.) These games, all played by West, are presented with only the lightest of notes. A short bibliography and variation & player indices wraps up the book. Production quality is on the upper end of opening monograph standards, with clear text and diagrams, decent paper, a glossy cover (but what a boring graphic!) and a real binding instead of just a stapled spine. The most likely reader complaint will be that The Philidor Countergambit offers minimal discussion of an extremely complex topic. The analytic section has almost no text save a liberal sprinkling of "better is..." and "Black can also continue..." West possesses uncommon practical experience with this opening and his impressions would have been valuable. What's the toughest line to meet? Where are the most fertile areas for further investigation? 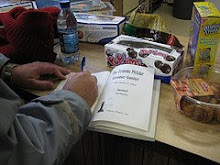 However, none of this outweighs the essential contribution of The Philidor Countergambit, which is to pull together an unprecedented concentration of material about an opening that chess literature has not handled well in the past. West demonstrates that the Philidor Countergambit has been widely underestimated and can be great fun.